Young Alumni trips for 22-35 year olds!! Be enchanted by the lush beauty of Cambodia and the teeming excitement of bustling Phnom Penh. See the sights by tuk-tuk in Siem Reap and go deep into the jungle as we explore the mysterious 12th-century Angkor Wat. Peer into Vietnam’s imperial past and descend into the Vietcong’s Cu Chi tunnels. Indulge in the delicious cuisine, culture and heritage of these fascinating Indochinese countries. See the One Pillar Pagoda, Temple of Literature, "Hanoi Hilton" Prison in Hanoi and much more …! This journey will take your breath away! We start our guided city tour at the Reunification Palace, the witness of the fierce Vietnam War that ended in 1975. The grand building is a museum today and serves as a hall for official receptions. See Notre Dame Cathedral and the Central Post Office, the city’s major landmarks. Walk down Nguyen Hue Street and take photos of the Opera House and the Ho Chi Minh Committee. We continue our walk to Ben Thanh Market, one of the most typical symbols of Saigon, to experience the daily life of locals and have an opportunity to shop for hand-made goods. Duration: approx. 2.5 hours. On our guided ‘cyclo tour’ go through the fascinating network of narrow alleys and shop houses also known as 'The 36 Streets' - each street being named after the merchandise traditionally sold there, ranking from fabrics to crafts and from medicines to tombstones. Drop by at Ngoc Son Temple located on the Hoan Kiem Lake. The excustion includes an English speaking guide, the Cyclo trip (pick up/drop off at hotel), 1 bottle of water. Duration: approx. 2 hours. Our Indochina trip begins with an overnight flight to Phnom Penh, Cambodia; Kingdom of Wonder. After arrival, transfer to your hotel. Take time to relax and unwind before our welcome orientation this evening. Begin to explore the unique French colonial architecture, palm-lined boulevards, majestic Khmer ruins and lush landscapes as you discover the indelible spirit of this exotic land. Cambodia’s capital is the perfect place to delve into the country’s history and culture. Our morning city tour includes the ornate Royal Palace, the Silver Pagoda and the National Museum of Khmer Arts, with graceful statues of Hindu gods and ancient Sanskrit tablets. Later, we’ll visit the hilltop Buddhist Temple, Wat Phnom, the Choeng Ek Killing Field Memorial, and the Tuol Sleng Museum, recounting the rise and fall of the Khmer Rouge in the 1970s. Cambodian food is Southeast Asia’s oldest cuisine offering amazing curries, stir-fried lok lak, and savory noodle dishes. Experience tasty Khmer specialties at our dinner tonight. After breakfast, we drive to Siem Reap. En route, stop to visit the fascinating spider market and ancient Naga Bridge. Check in to our hotel early this afternoon with free time until our exciting ‘tuk tuk’ trip along the colorful riverside of Siem Reap. Our excursion includes a visit to a lively food market where locals gather to picnic with their families (Crispy crickets anyone?). Try out your negotiating skills as you shop for bargains before a traditional dinner this evening. Ancient temples rise through the thick mysterious jungle as we visit the UNESCO World Heritage Site of Angkor Wat and Banteay Srei temples today. Angkor Wat is famous for its splendor and features the longest continuous bas-relief in the world narrating stories from Hindu mythology. It was originally constructed as a Hindu temple dedicated to the god Vishnu for the Khmer Empire, then gradually transformed into a Buddhist temple towards the end of the 12th century. After lunch at a local restaurant, we visit incredible Ta Prohm; the fortified city of Angkor Thom; the mysterious Bayon Temple; and the Terrace of the Leper Kings. Surrounded by the jungle, these ancient temples settle among enormous fig trees and giant creeper roots, slowly becoming reclaimed by the powerful forces of nature. Return to Siem Reap this evening. Board our short flight to Ho Chi Minh City, Vietnam. Upon arrival at Tan Son Nhat International Airport, we’ll transfer to our hotel. Time permitting; opt to participate in a half day city tour. Sights include Notre Dame Cathedral, French-style Colonial Post Office, Jade Emperor Pagoda, the former Presidential Palace, and a visit to Ben Thanh market. Otherwise the remainder of the afternoon is at leisure. Join us for tonight’s relaxing Vietnamese buffet dinner and sunset cruise on the Saigon River. We depart early this morning on our excursion to the Cu Chi Tunnels. This is an incredible underground tunnel network of approximately 125 miles, built by Viet Cong, housing hideouts, hospitals and shelters. Afterwards, visit the local market of Cholon and bustling old town “Saigon.” We’ll also see the War Museum, featuring photographs and weapons of the Vietnam wars, as well as the original French “Guillotine.” A free evening in Ho Chi Minh is perfect for night-owl revelers with a seemingly endless array of diversions from stunning rooftop bars and pulsating nightclubs, to fun night markets and street bars. Take your pick in the city that doesn’t sleep. Enjoy today at your leisure shopping for souvenirs or join an optional excursion to the Mekong Delta where we take sampan boats through narrow jungle canals, fishing villages and floating markets. In the evening we are invited to a water puppet show, a unique Vietnamese art form performed in a large pool. At our farewell dinner, savor dishes from this thriving food scene with delicacies including pho and fresh seafood infused with fragrant herbs. For some of us, our Indochina adventure ends after breakfast as we bid farewell to new friends, and begin to plan our next adventure. After breakfast, transfer to the airport for our flight to Hai Phong. Upon arrival, we travel to Ha Long Bay, a UNESCO World Heritage site and one of the world's most spectacular natural wonders. We board our cruise ship and enjoy a relaxing evening on board. Today, we cruise along the Bay and enjoy the picturesque scenery with some 2,000 limestone islands rising amazingly from the clear, emerald waters. The limestone karst formations are strewn with beaches, grottos and beautiful caves. Along the way we will anchor for a leisurely swim in a secluded cove and take an excursion to one of the many hidden grottos beneath the towering cliffs. Enjoy a leisurely dinner on board tonight with tranquil views of the bay and an unforgettable sunset from the upper deck..
After brunch, we board our coach for the transfer to Hanoi. Hanoi, the capital city of Vietnam, is a stylish and gracious city that retains a unique old world charm and some of Asia’s most striking colonial architecture. The many lakes and parks also create a relaxing atmosphere in this otherwise bustling city. Explore the city and visit the One Pillar Pagoda, the Temple of Literature (the first national university of Vietnam built in 1070), and the “Hanoi Hilton” prison (where John McCain and other POWs were kept during the Vietnam War). Opt to join a fun “Cyclo” rickshaw ride through the buzzing Old Quarter of Hanoi. During your free evening, soak up the nightlife from a plastic stool in the walking street district sampling steamed peanuts and exotic snacks, or go high-end at a famous jazz club or insane multi-level nightclub.. This morning, we transfer to the airport for our flight home with dreams of returning to this land of enchantment soon. 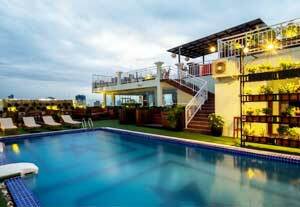 Le Mont Hotel, located in the Chamkar Mon district of Phnom Penh features a rooftop swimming pool,open-air in-house restaurant and a sky bar. It is in walking distance of the Tuol Sleng Genocide Museum and the National Museum. Free WiFi is available throughout the property. Air-conditioned rooms are furnished with contemporary furniture and feature a flat-screen cable TV, mini-bar and a desk. Private bathrooms are equipped with shower facilities, a hairdryer and free toiletries. 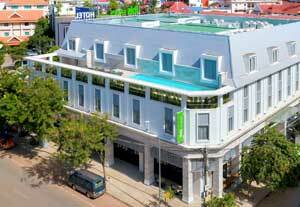 The Ibis Styles hotel is located within short distance of Pub Street, King's Road Angkor and the Old Market. Free WiFi is available throughout the property. 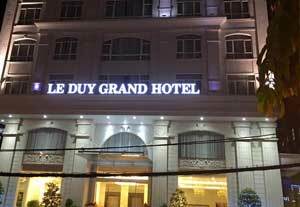 Le Duy Grand Hotel is located in a 15-minute walking distance from War Remnants Museum and the Reunification Palace and approx. 1 mile from the Ben Thanh Street Food Market and Tao Dan Park. Rooms are equipped with a private bathroom, a flat screen TV and a desk. Free WiFi is available throughout. The hotel features and outdoor pool. 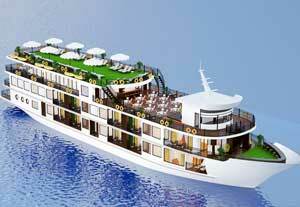 The 5-star Ancora Cruises offers a private beach area (at dock), a 24-hour front desk and free WiFi. The property features a hot tub, evening entertainment and a shared lounge. Rooms are complete with a private bathroom equipped with free toiletries a seating area and a desk. A buffet breakfast is available daily at the property. The on-site restaurant specializes in Vietnamese and Seafood cuisine. 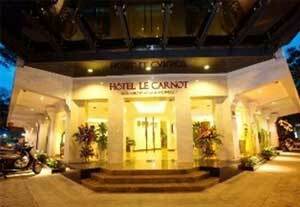 Nestled in the famous Old Quarter, Hotel Le Carnot is located conveniently within a 5-minute walk to Hang Dau Tower, Cua Bac Church and Dong Xuan Market. Wi-Fi is free throughout the property. Rooms are furnished with a wardrobe, a personal safe, desk and a flat-screen cable TV. Tea/coffee making facilities and a mini-bar are also included. The private bathroom comes with shower, slippers and free toiletries. * Price per person based on a twin share room. If you are a solo traveler, upon request AESU can attempt to arrange for you to share a twin with a same-gender traveler. If you prefer a single room, or if AESU cannot arrange a shared room a single supplement of $395 will be applied to your reservation. Fly into Pnohm Penh, return from Ho Chi Minh City. Purchase your airfare from AESU and receive free arrival/departure transfers between the airport and your hotels. We also try to book you on the same flights as others traveling on your tour. Land only participants BOOKING OWN FLIGHT OVERSEAS, DO NOT receive airport arrival/departure transfers. If you book land only with us, book your flights from the USA one day earlier than the tour start date. If you are not booking flights through AESU, we recommend not booking airfare until your tour is guaranteed (This will be noted on website with “guaranteed departure” next to tour start date). Click on a date above to get a quote or book online. You can make your $500 deposit ONLINE to confirm your space on the land tour. Full payment isn't due until 120 days before departure, and you or friends and family can make partial payments after you've booked (See NOTE below if within 120 days). Or you can scan/email or fax a booking form. NOTE: Reservations to be paid in full 120 days prior to departure. Reservations received after this date are subject to availability and any airfare quote can only be held for 72 hours. Payment in full, for late bookings, will be due upon receipt of invoice from AESU. A late booking fee of $100 per person will apply. After paying a deposit of $500 online to reserve your spot, you can pay your balance in as many installments as you like, with a minimum of $100 for each transaction and no service fee. Please indicate booking number on your check payment. If you prefer to pay installments by credit card, please call us at 800-638-7640 for details. (All prices reflect a cash discount. There is a 4% processing fee for any payments made by credit card after initial deposit.) The total tour cost (land, and air if applicable) must be paid in full at least 90 days before departure. Email Vietnam & Cambodia to a friend!